ParentingABC-Blog: What Are You Grateful For? Have you ever taken things or people for granted? I have! Sometimes I lose perspective and let circumstances, things, and people drag me down. Maybe you are feeling down because this year did not go according to your plan. Please let me know and I will pray for you. Life on earth is unpredictable but we can hold onto God's promises, such as, "For I know the plans I have for you," declares the LORD, "plans to prosper you and not to harm you, plans to give you hope and a future" (Jeremiah 29:11). 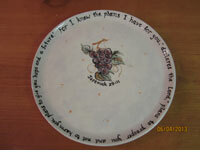 My life verse was written on a custom-made ceramic plate given to me in 2004 by young couples and parents in the English Ministry of our first church. That plate always sits in my living room (or dining room) to remind me of God's plans. Thank God for everyone who has been part of my journey through life and ministry. I am so grateful for James, our extended families and church families, and friends. I am grateful for the recent baptism of four young people and the upcoming baptism of my sister's husband in December. Thankfully, when I am down, reciting memory verses or singing praises and hymns often turn me around and the Word of God reconnects me to my Lord and my God. One of my favorite Chinese praise songs, Bless the Lord, O my soul, has lyrics quoted from Scripture. Last week, the mother of a dear friend passed away after suffering prolonged illnesses. When my friend shared sweet mother-daughter moments in spite of the messiness of things, I was deeply touched. I was amazed that my friend's elderly Chinese mother wished to donate her body to Stanford Hospital, and how the daughter honored such special request. They have shown me how to trust in the Lord with freedom to live and die in Christ. Having an eternal perspective is so important! May this feature article help you identify at least one person and/or one thing you are thankful for this year! "Give thanks to the Lord, for He is good. His love endures forever." (Psalm 136:1) Indeed, we're thankful for our health, our safety, our loved ones. But what else? What do we take for granted? What moves us? What would fill our hearts daily if we would just notice it? 1. The senses. Sight, sound, touch, smell and taste -- daily miracles each of them. 2. The plant world. From the productivity of a late-summer tomato plant to the delicate unfurling of a fern, nature's exuberance and tenderness is something to behold. 5. The ability to learn. There is no age limit on learning -- period. When we stop learning, we really stop living. 6. Young children. They model for us innocence, faith, resilience, playfulness and unconditional love. 7. Music. 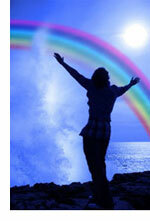 What inspires you, lifts your mood? Rock & roll, African drumming, violin concertos, Turkish ud, gospel? A nightingale? 8. The ability to give. Every act of love benefits the giver as much as the receiver. 9. Color. Sunsets, Gauguin paintings, green peppers, blue sky, purple. Imagine a world without color. 10. Change. It's unavoidable; the only constant. Change can be unsettling or challenging. But the mystery of it and what lies beyond it can keep us young at heart. Does this seemingly random list stir up some feelings in you? Can you think of other things that you are grateful for? Please write and let me know. Thanks for sharing!